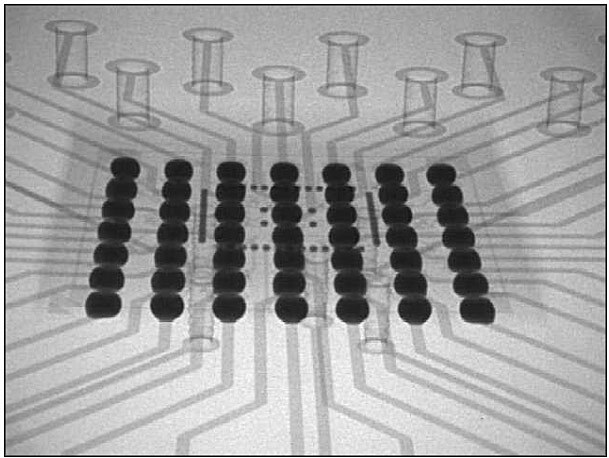 Memory module makers often use X-ray technology to inspect samples taken from a manufactured batch for abnormal soldering joints. BGA connections are not easily accessible from all sides and as a result advanced imaging technologies such as X-ray, in-circuit testing and specialised microscopes are used. X-ray images can be taken from all angles to verify proper connections between the DRAM chip and the underlying PCB. More recent advances in imaging solutions can work with lead-free solder paste that's required to comply with RoHS (the Restriction of the use of certain Hazardous Substances in electrical and electronic equipment) guidelines while providing computer generated 3D details. Common BGA defects include solder bridging, missing solder joints, misalignment, and open solder joints. The quality control process is usually automated with optical recognition software. The machine tries to detect defects such as joints bridging, an excessive number of voids, and irregular joint diameters or non-circular ball joints. All manufacturers use variations of the above X-Ray technique. BGA soldering ball - Darker ring at the edge indicate good wetting and bright spot represent voids. Voids or bubbles in joints are considered bad but they are extremely difficult to prevent in the manufacturing process and are usually kept under a certain percentage against total connectivity. When the void gets too large, it will starve the solder joint and compromise the connection geometry. Excessive voids in BGA joints will shorten the memory module’s lifespan by weakening the contacts during thermal cycles. Other manual inspection processes include using functional verification, Internal Circuit Testers (ICT) and specialised probes. Sometimes, the "Oblique Views at Highest Magnification" (OVHM) X-Ray technique is used instead of the typical tilting method to inspect the soldered balls from an angle, without any loss of magnification.